Horsehsoe pendant, the Gorgeous Horse is your source for custom equestrian jewelry. This is high fashion with an equine twist, only the horse lovers will know that well! The graduated diamonds are a sublte yet profound display of craftsmanship. Check it out in white gold too! 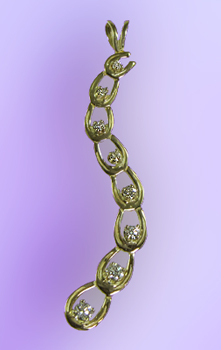 Set with .38 ct of matching brilliant cut diamonds. Dimensions: 1/4 inch wide x 2 inches long.